OISTAT stands for l'Organisation Internationale des Scénographes, Techniciens et Architectes de Théâtre - International Organization of Scenographers, Theatre Architects and Technicians. Officially founded in Prague in 1967, the office is now based in Taiwan. To stimulate the exchange of ideas and innovations, and to promote international collaboration in professions which support live performance. To promote the formation of national centres in each country in order to achieve these aims. To respect the integrity of all cultures and celebrate the diversity as well as the similarities of those who work in support of live performance. To this end OISTAT has Centres in 34 countries around the world with combined membership of over 12,000 members; six active Commissions undertaking a variety of projects in the areas of Education, Technology, Scenography, History and Theory, Publication and Communication, and Architecture; and a growing active presence worldwide through its website. CITT/ICTS members are invited to participate in projects initiated by other OISTAT member countries. 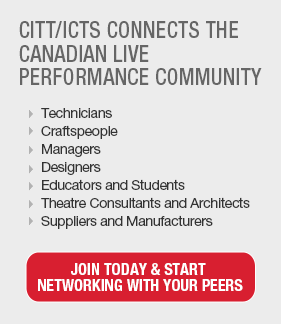 CITT/ICTS members may also seek information concerning live performance practice in other OISTAT member countries through CITT/ICTS OISTAT Commissioners. CITT/ICTS has OISTAT Commissioners in the areas of Architecture, Education, History and Theory, Scenography and Technology. The Commissioners report the activities of the Commissions in StageWorks and on the Website. The Commissioners also liaise with CITT/ICTS members to encourage them to participate in and initiate international projects. Contact the appropriate CITT/ICTS OISTAT Commissioner to obtain information on current projects or visit our website. The CITT/ICTS National Office can assist you in contacting the CITT/ICTS OISTAT Commissioners. Al Cushing, CEO of the Yukon Arts Centre in Whitehorse was elected on the OISTAT Executive Committee at the World Congress held in Seoul in September 2009 and served until 2010. Before him, Peter McKinnon, lighting designer and professor at York University has served on the Executive Committee for many years. CITT/ICTS proudly hosted the OISTAT Education Commission Meeting in 2007 during the 2007 Annual Conference held in Vancouver. Other meetings held in Canada include an Executive Committee meeting hosted by Peter McKinnon at Buckshot Lake Ontario in 2003. CITT/ICTS also welcomed the presence of OISTAT delegates at the OISTAT 2005 World Congress in Toronto.